Five Level Cascaded H-Bridge D-STATCOM using a new Fuzzy and PI Controllers model for Wind Energy Systems, YANMAZ, K., ALTAS, I. H., MENGI, O. O. Improved Classification by Non Iterative and Ensemble Classifiers in Motor Fault Diagnosis, PANIGRAHY, P. S., CHATTOPADHYAY, P.
Wavelet Energy and the Usefulness of its Powers in Motion Detection, VUJOVIC, I., KUZMANIC, I. New Stator Tooth for Reducing Torque Ripple in Outer Rotor Permanent Magnet Machine, OZOGLU, Y. Low Complexity Hybrid Precoding for Broadband mmWave Massive MIMO Systems, HUANG, Y., LIU, C., SONG, Y. In any real-time operating system, task switching and scheduling, interrupts, synchronization and communication between processes, represent major problems. The implementation of these mechanisms through software generates significant delays for many applications. The nMPRA (Multi Pipeline Register Architecture) architecture is designed for the implementation of real-time embedded microcontrollers. It supports the competitive execution of n tasks, enabling very fast switching between them, with a usual delay of one machine cycle and a maximum of 3 machine cycles, for the memory-related work instructions. This is because each task has its own PC (Program Counter), set of pipeline registers and a general registers file. The nMPRA is provided with an advanced distributed interrupt controller that implements the concept of interrupts as threads. This allows the attachment of one or more interrupts to the same task. In this context, the original contribution of this article is to presents the solutions for improving the response time to interrupts when a task has attached a large number of interrupts. The proposed solutions enhance the original architecture for interrupts logic in order to transfer control, to the interrupt handler as soon as possible, and to create an interrupt prioritization at task level. J. Shawash, D. R. Selviah, "Real-Time Nonlinear Parameter Estimation Using the LevenbergMarquardt Algorithm on Field Programmable Gate Arrays," IEEE Trans. Ind. Electron., vol. 60, no. 1, pp. 170176, Jan. 2013. M. Shahbazi, P. Poure, S. Saadate, M. R. Zolghadri, "FPGA-Based Reconfigurable Control for Fault-Tolerant Back-to-Back Converter Without Redundancy," IEEE Trans. Ind. Electron., vol. 60, no. 8, pp. 33603371, Aug. 2013. M. Shahbazi, P. Poure, S. Saadate, M. R. Zolghadri, "Fault-Tolerant Five-Leg Converter Topology With FPGA-Based Reconfigurable Control," IEEE Trans. Ind. Electron., vol. 60, no. 6, pp. 22842294, Jun. 2013. T. T. Phuong, K. Ohishi, Y. Yokokura, C. Mitsantisuk, "FPGA-Based High-Performance Force Control System With Friction-Free and Noise-Free Force Observation," IEEE Trans. Ind. Electron., vol. 61, no. 2, pp. 9941008, Feb. 2014. V. G. Gaitan, N. C. Gaitan, I. Ungurean, "CPU Architecture Based on a Hardware Scheduler and Independent Pipeline Registers," IEEE Transactions on Very Large Scale Integration (VLSI) Systems, vol. 23, no. 9, pp. 16611674, Sept. 2015. M. Zimmer, D. Broman, C. Shaver, E. A. Lee, "FlexPRET: A processor platform for mixed-criticality systems," in 20th IEEE Real-Time and Embedded Technology and Applications Symposium - RTAS, pp. 101110, Apr. 2014. E. Dodiu, V. G. Gaitan, A. Graur, "Custom designed CPU architecture based on a hardware scheduler and independent pipeline registers  architecture description", in IEEE 35th Jubilee International Convention on Information and Communication Technology, Electronics and Microelectronics, Croatia, pp. 859-864, 24 May 2012. E. Dodiu, V. G. Gaitan, "Custom designed CPU architecture based on a hardware scheduler and independent pipeline registers  concept and theory of operation," in IEEE EIT International Conference on Electro-Information Technology, Indianapolis, USA, pp. 15, May 2012. A. S. R. Oliveira, L. Almeida, A. B. Ferrari, "The arpa-mt embedded smt processor and its rtos hardware accelerator", IEEE Trans. Industrial Electronics, vol. 59, no. 3, pp. 890-904, August 2009. S.A. Edwards, E.A., Lee, "The Case for the Precision Timed (PRET) Machine," Design Automation Conference, 2007. DAC '07. 44th ACM/IEEE, vol., no., pp.264-265, 4-8 June 2007. P. Kuacharoen, M. Shalan, V.J. Mooney III, "A Configurable Hardware Scheduler for Real-Time Systems", in Proc. Engineering of Reconfigurable Systems and Algorithms, pp.95-101, 2003. D. Andrews, W. Peck, J. Agron, K. Preston, E. Komp, M. Finley, R. Sass, "hthreads: a hardware/software co-designed multithreaded RTOS kernel", Emerging Technologies and Factory Automation, 2005. ETFA 2005. 10th IEEE Conference on, vol.2, pp.338, 19-22 Sept. 2005. N. C. Gaitan, V. G. Gaitan, E.-E. (Ciobanu) Moisiuc: "Improving Interrupt Handling in the nMPRA", In Development and Application Systems (DAS), 2014 International Conference on. IEEE, pp. 11-15, 1517 May, 2014. C. Kyrkou, T. Theocharides, "A Parallel Hardware Architecture for Real-Time Object Detection with Support Vector Machines," in IEEE Transactions on Computers, vol. 61, no. 6, pp. 831-842, June 2012. N. C. Gaitan, I. Zagan, V. G. Gaitan, "Predictable CPU Architecture Designed for Small Real-Time Application - Concept and Theory of Operation," International Journal of Advanced Computer Science and Applications  IJACSA, vol. 6, no. 4, 2015. 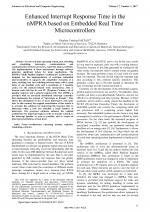 L. Andries, G. Gaitan, "Dual priority scheduling algorithm used in the nMPRA microcontrollers: Subtitle as needed (paper subtitle)," 2014 18th International Conference on System Theory, Control and Computing (ICSTCC), Sinaia, 2014, pp. 43-47. E. E. C. Moisuc, A. B. Larionescu, I. Ungurean, "Hardware event handling in the hardware real-time operating systems," 2014 18th International Conference on System Theory, Control and Computing (ICSTCC), Sinaia, 2014, pp. 54-58. E. E. Moisuc, A. B. Larionescu, V. G. Gaitan, "Hardware Event Treating in nMPRA," in 12rt International Conference on Development and Application Systems  DAS, Suceava, Romania, pp. 66-69, 1517 May, 2014. A. Kalyansundar, R. Chattopadhyay, "A Novel Approach to Hardware Architecture Design and Advanced Optimization Techniques for Time Critical Applications," 2008 IEEE/IFIP International Conference on Embedded and Ubiquitous Computing, Shanghai, 2008, pp. 9-15. I. Zagan, V. G. Gaitan, "Schedulability analysis of nMPRA processor based on multithreaded execution," 2016 International Conference on Development and Application Systems (DAS), Suceava, 2016, pp. 130-134. L. Andries, V. G. Gaitan, E. E. Moisuc, "Programming paradigm of a microcontroller with hardware scheduler engine and independent pipeline registers - a software approach," 2015 19th International Conference on System Theory, Control and Computing (ICSTCC), Cheile Gradistei, 2015, pp. 705-710. 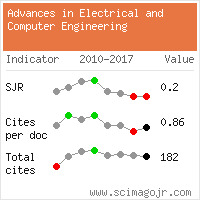 Citations for references updated on 2019-04-22 10:53 in 145 seconds. Website conception, design and maintenance by Eugen COCA. Content updated on 28 Feb 2019. Site engine updated on 28 Feb 2019. This page was generated on the server in 0.041 seconds and loaded in your browser in > seconds.